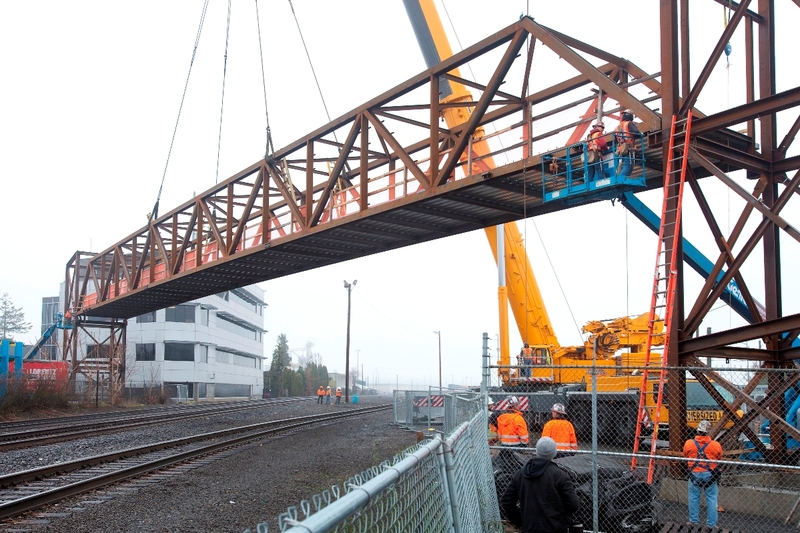 A 70-ton, 184-foot pedestrian/bike span is lifted into place over the Union Pacific Railroad tracks. As part of the Portland-Milwaukie Light Rail Transit Project, a new pedestrian bridge is under construction near the future Rhine St/SE 17th Ave Station. Today, crews lifted the new pedestrian overcrossing structure over the Union Pacific Railroad tracks. The Portland-Milwaukie project and Union Pacific are contributing towards the construction of the overcrossing. Tigard-based Fought & Company, Inc. fabricated the steel span and towers. The original pedestrian crossing was built in the early 1940s, and was demolished in July 2014 to make way for the improved overcrossing. The new pedestrian bridge will cross between SE Rhine and Lafayette streets and line up with the signalized pedestrian crossing for the new MAX Orange Line Rhine St/SE 17th Ave Station. Over the next several months, Lorenz Bruun Construction, headquartered immediately adjacent to the bridge’s east landing, will continue construction on the bridge deck, stairs and elevators. The bridge is scheduled for completion in the summer of 2015. The new bridge provides pedestrian and bicycle enhancements for the Brooklyn neighborhood and connections to Cleveland High School, Fred Meyer headquarters in addition to the SE 17th Ave & Rhine Street Station and nearby bus stops. Glass elevator cabs increase visibility and improve security and are large enough to accommodate bicycles with trailers or a child’s tag-along attachment. Elevators have two doors that allow bicyclists to enter and exit the elevator without having to turn around. Bridge span width will be increased from 6 feet wide to 12 feet wide; stair width will be increased 2 feet to 8 feet. Stairs have been straightened to provide clear sight lines. Adding closed-circuit television cameras and improved lighting. Bike gutters provide greater ease to move bicycles up and down stairs. Public art inspired by the adjacent rail yard and incorporating poetry written in conjunction with Cleveland High School students. 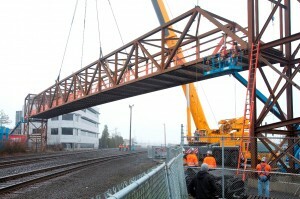 The construction cost of bridge replacement is $3.9 million, split between the Portland-Milwaukie light rail project ($2.2 million) and Union Pacific ($1.7 million).